The Verve Live: Former Verve Frontman's Solo Debut Surprisingly Upbeat Richard Ashcroft addresses 'joyous, celebratory facets of life' on new album. Former Verve Frontman's Solo Debut Surprisingly Upbeat Richard Ashcroft addresses 'joyous, celebratory facets of life' on new album. 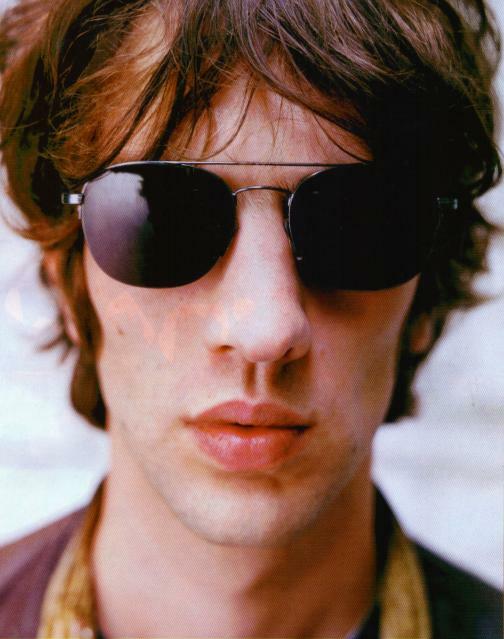 NEW YORK - With his intense gaze, sharp features and long sideburns, former Verve frontman Richard Ashcroft was still easily recognizable last week as the guy who shoved aside hapless pedestrians in the much-played video for "Bittersweet Symphony," his band's 1997 breakthrough hit. But the singer no longer has the gaunt, hollow-cheeked look of the past, and he's lost some of his pallor - physical evidence, perhaps, of the newfound contentment he sings of on his debut solo album, Alone With Everybody. "I probably touched on more darker elements [in the past], and I hadn't expressed myself in the more joyous, celebratory facets of life. I've got many things to celebrate about, and I wanted to put that down on record," Ashcroft said as he sat in his publicist's Gramercy Park office last week. The singer, a 28-year-old native of the small English city of Wigan, is married to former Spiritualized member Kate Radley, who recently gave birth to a boy. Songs such as the upbeat "Crazy World" and the ballad "You on My Mind(in My Sleep)," are unabashedly sweet love songs that show not a trace of the bitterness and despair that marked some of Ashcroft's earlier lyrics with the Verve, who broke up last year. At the same time, with its rich orchestral arrangements and layered vocals, Alone With Everybody, scheduled for U.S. release June 27, is unmistakably the work of the Verve's former frontman. "Sonically, I wanted to take off where I'd left off on the last album," Ashcroft said. "I thought there was unfinished business as far as what I discovered in the studio making 'Bittersweet Symphony' and some of those tracks." Driven by strings and thickly stacked vocal tracks, "A Song for the Lovers," the album's first single in the UK, is squarely in the vein of the Verve's final album, Urban Hymns. That album spawned the hits "Bittersweet Symphony" and "The Drugs Don't Work." On other tracks, though, Ashcroft strays far from the Verve's psychedelic sound. "C'mon People (We're Making It Now)" is straight-ahead, guitar- and piano-driven rock, with a melody that owes a debt to the Four Tops' '60s hit "Reach Out I'll Be There." "Money to Burn," meanwhile, combines a looped beat with honky-tonk guitars, horns and classic rock 'n' roll sentiments: "I got money to burn I wanna burn it to you/ C'mon, yeah we got one short life I wanna spend it with you," Ashcroft croons. "He's drawing more from his influences [and] I think it can only be a good thing," Nick Saunders, a 28-year-old Verve fan from Hertfordshire, England, wrote in an email. "You can hear country, blues, gospel, hip-hop and even Elvis in ... 'Money to Burn.' "
Several other Verve fans who've heard Ashcroft's new music said they were excited about his new direction, though some pined for the Verve of old. "Fans of Verve's earlier albums ... who didn't care for Urban Hymns' more pop-oriented approach have already jumped ship," Matthew Keith, a 28-year-old from Pittsburgh, wrote in an email. "Those who have grown with Richard will embrace the project. Those that never knew Verve until 'Bittersweet Symphony' will love it." Ashcroft, who cites Frank Sinatra, Elvis and Brian Wilson among his influences, said that he was anxious to combine sounds from different eras and genres on his album. But he was equally intent on crafting songs that worked even without elaborate arrangements. "There's no boundaries - there's nothing that can't be combined with something else ... and I think that's the only way that roots, traditional kind of rock 'n' roll, can ever grow or survive," he said. "But the real core of the song still has to be there - [you] still have to be able to pick a guitar or a piano and sing that song and it has to move people. There has to be a foundation to build all the madness on." Ashcroft displayed his songs' foundations Friday evening in one of his first solo performances, a brief acoustic set at the intimate Manhattan venue Joe's Pub. He stripped his arrangements down to simple chord-strumming, singing straightforward, passionate versions of such album tracks as "New York" and "I Get My Beat," in addition to the Verve's "Lucky Man" and "Bittersweet Symphony." Ashcroft, who periodically posts video and audio clips on his official Web site (www.richardashcroft.co.uk), is scheduled to play the V2000 Festival in England in August. He also plans to mount his first solo tour of the United States in the fall.